Part of the Anglican revival in the 19th Century involved the establishment of religious communities. The idea of monks and nuns, set apart and living consecrated lives, was totally anathema to protestantism, so you may imagine the controversy generated in the 1850s when a community of Sisters took up residence in the Ditchingham countryside. However, the All Hallows community flourished, and by the end of the 19th century they were not only running a hospital, an orphanage and a home for fallen women, but also a school. Here, in the narrow, winding lanes of Ditchingham parish, barely two miles from Bungay but with the feeling of one of the most remote spots in all East Anglia, survives today a complex of late 19th and early 20th century red brick gothic buildings, and one of them is the former school, a maze of corridors connecting what were once separate buildings. 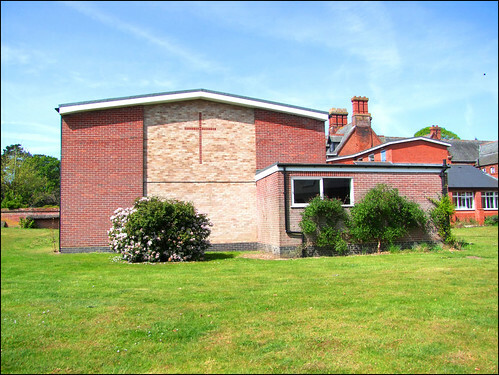 The chapel of the school was rebuilt in 1960 in memory of Herbert Palmer, Warden of the Community of All Hallows and Chaplain to the school. It is a large, light, airy building, absolutely typical of its date: ten years earlier and there would have been more of a sense of a shadowy past, and ten years later it would have responded to the reforms of Vatican II (despite being Anglican) by having an altar in the centre rather than at the east end. The main focus and great highlight of the chapel is the vast mural reredos depicting Revelations of Divine Love, based on the writings of Julian of Norwich, by the Australian artist Alan Oldfield. It was installed here in 1989. This is outstanding, one of the major religious artworks in East Anglia of the 20th Century. At the installation of the piece, Oldfield observed that this painting is my way of paying back what I have learned from Julian of Norwich. She is not a very visual mystic, but as she struggled to put her vision into words, so I have struggled to clarify in paint what I feel about her work. The two main figures are Julian herself on the far right of the painting, her reading desk in front of her and vernicle on the wall behind. At the centre is the risen Christ, emerging from folds iin the universe. At the far left a shadow falls, and there are other references to what she described in her visions. The former chapel, in the main buildings, was split in two with a false floor, the lower half becoming the library and the upper floor into bedrooms. However, the school closed about ten years ago, and became for a while the St Gabriel's Retreat Centre. In 2009 the buildings were taken over by an Anglican trust, and rebadged as Belsey Bridge Conference Centre. The complex still serves as a place for private and group retreats, but is also available to churches of all denominations for meetings and other get-togethers. The chapel was reordered slightly: the floor was carpeted, the old furnishings were removed and replaced with modern chairs. Overhead projectors and screens were installed, not only to meet the needs of conferences, but also the demands of modern liturgical forms of worship. The altar and other sanctuary furnishings can be easily removed if the chapel, the largest room in the complex, is required for secular use. However, I was pleased to find one of the old All Hallows prayer desks with its embroidered kneeler still in the corner of the sacristy.